For use at airports as ground based beacon antenna, for Glide Slope Monitoring and Localizer Monitoring Antenna, the antenna retains the Pulse Shape without introducing any distortion in the receiving and transmission mode. The radiation pattern is such as to work with air borne transponder providing coverage in angular sector of 60 degrees on either side of the nose of the aero plane and 20 degree above and below the horizon. These are rugged, all weather beacon antenna and is made of high quality ¼ inch round aluminum elements and ¾ Inch round aluminum boom. Special mounting hardware is fixed on the back of the antenna which permits the antenna for 360 Degrees in Azimuth and 90 Degrees in Elevation orientation. These beacon antenna can be mounted to work as Horizontal or Vertical polarized antenna and are delivered in fully assembled condition. These beacon antenna feed is designed with tunable feed, eliminating the use of folded dipole. The antenna termination uses N-Female connector fixed on the antenna dipole. 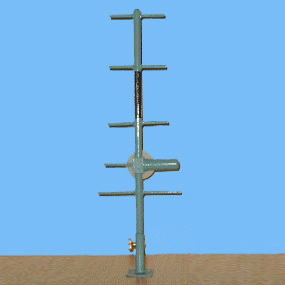 The unique design of the beacon antenna feed also works as matching device together with antenna tuning facility to keep the low VSWR with perfect radiation pattern. 1. SLM-95010 905.1 - 932.4 MHz MHz 10 dBi.